While it’s home really is San Francisco, Ghirardelli Chocolate Company does have a midwest location off Michigan Ave. in downtown Chicago. This heavenly little shop exudes sweet smells that drift past Water Tower Place and direct you through its doors. Under an iconic sign of bright lights (a smaller version of the one you can find in Ghirardelli Square in San Fran), Ghirardelli in Chicago is both a retail location and ice cream shoppe. After dinner at Gino’s East and a stroll up Michigan Ave. on our recent weekend in Chi-Town, we decided to indulge our sweet tooth in a rich, hot fudge-covered treat from Ghirardelli. 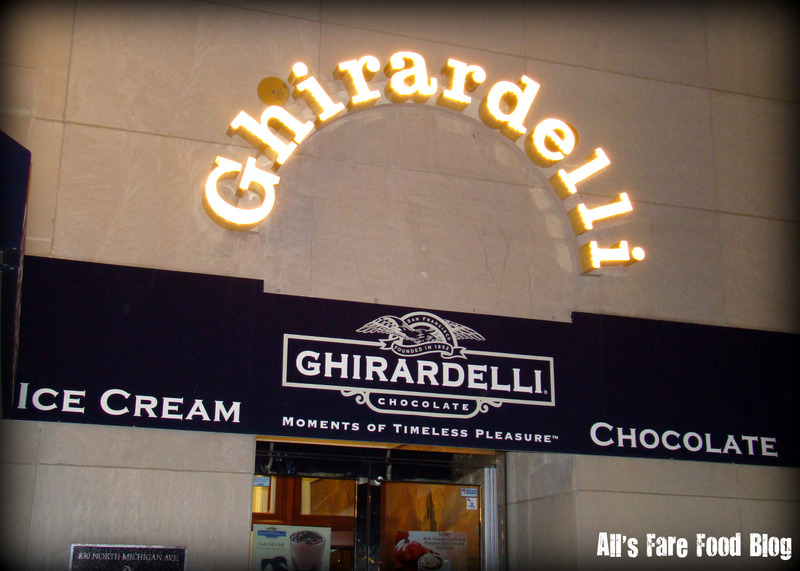 Ghirardelli has 10 chocolate stores and ice cream shoppes across the country. The only other one that I’ve been to is at Downtown Disney (click the link to check out DisneyFoodBlog’s review) at Walt Disney World in Florida. In comparison, the Disney location is much bigger and more decadent. But either way, you end up with a great chocolate treat. There are a few tables inside but it was a beautiful night so we opted to dine at one of the tables situated along the sidewalk. Funny enough, Ghirardelli’s Chicago location is right across the street from the Hershey store. So, if you want even more chocolate, head across the street to tempt your senses with Hershey Kisses, Reese’s Peanut Butter Cups and more. 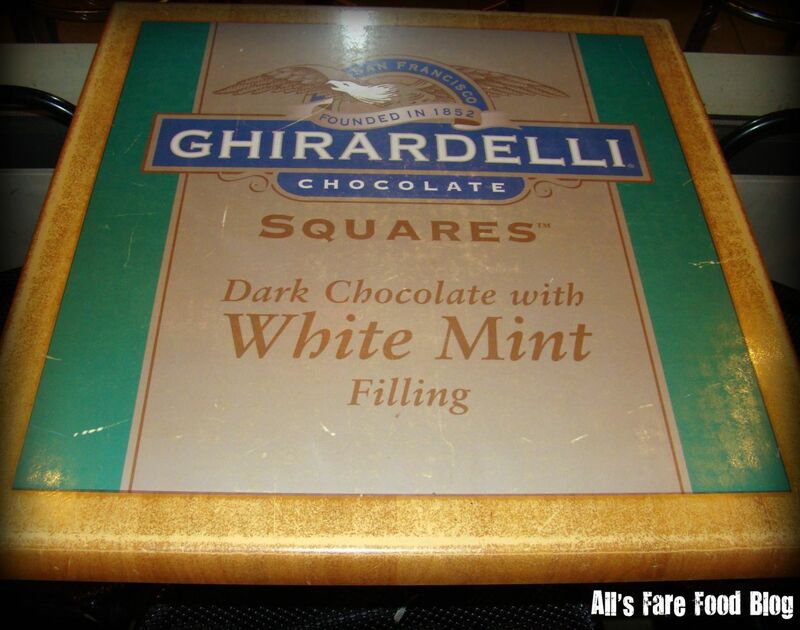 The tables are designed to look like the wrappers of Ghirardelli’s famous chocolate. We picked a dark chocolate with mint. Much healthier, you know. Click the image above to download the full menu at Ghirardelli’s ice cream shoppe. 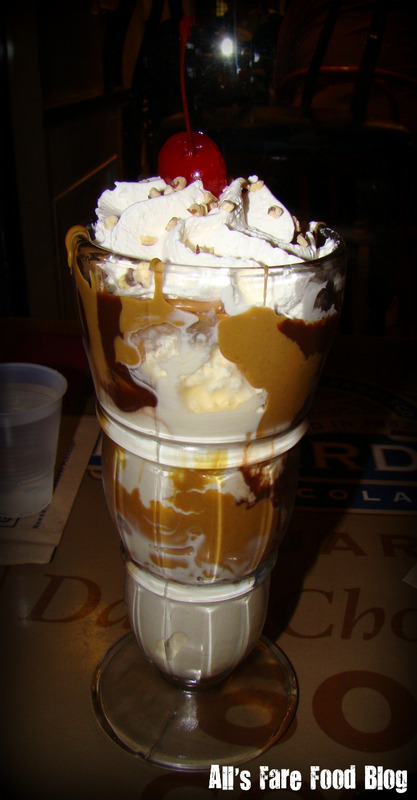 The hallmarks of the Ghirardelli menu are their sundae creations covered in freshly-made hot fudge in either milk chocolate or dark chocolate. Mmm….sorry, trying not to drool all over the keyboard. Sundaes have creative names to recognize San Francisco’s rich heritage like the Haight AshBerry (strawberry cheesecake ice cream, sliced strawberries, vanilla ice cream topped in blueberries, chocolate-covered blueberries, and a chocolate-dipped waffle roll) or the Cable Car (Rocky Road, chocolate chip and chocolate ice creams, marshmallow topping, hot fudge, whipped cream, almonds and Ghirardelli chocolate squares). You can also create-your-own sundae or indulge in hot chocolate, shakes or floats. The choices are hard to make with a menu like that but we finally decided on the Gold Rush sundae. Vanilla ice cream smothered in dark chocolate hot fudge and fresh peanut putter, then topped with whipped cream, almonds, a cherry and a milk chocolate square. It was rich, creamy, and oh-so-good. I could devour gallons of the hot fudge. But mix it together with the peanut butter and ice cream and you have a whirlwind of flavors creating a symphony in your mouth. While most of the sundaes start at $8.95, they’re worth it. Plus, they’re big enough you can share with one other person. Find out more about Ghirardelli, visit their website at www.ghirardelli.com. This entry was posted in Cuisine - Desserts, Places - Chicago and tagged Cable Car, Chicago, chocolate, dessert, Disney World, Downtown Disney, Ghirardelli, Gold Rush, Haight Ashberry, Hershey, hot fudge, ice cream, Michigan Avenue, San Francisco, sundaes by Christina. Bookmark the permalink.